Coordinating transportation with the funeral home you’re working with is often the easiest way to make these arrangements, though you can arrange transportation yourself. If the burial or cremation will happen after the funeral service, it has become customary for the family to be brought to the cemetery or burial site from the funeral site in a limousine or sedan that can seat many people. Would you prefer a motor or horse-drawn hearse? 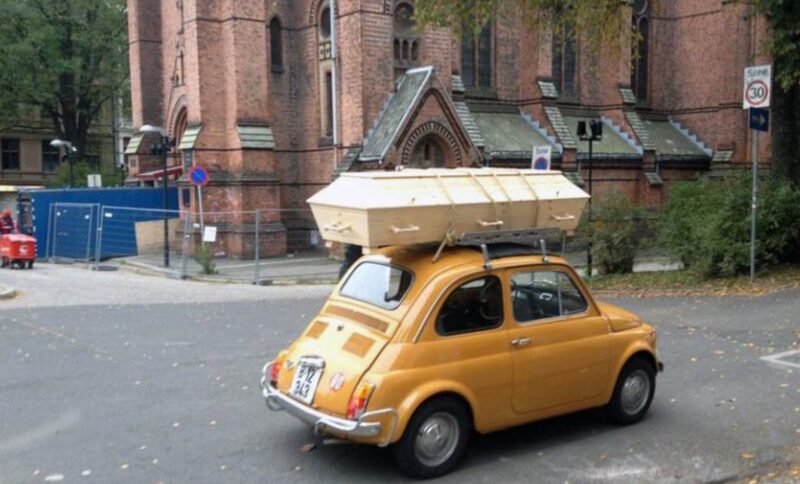 An additional hearse may also be required to carry the flowers. Will it take a special route? Where will you return to? The following is a list of funeral transport options available to you. If the body and casket were present at the funeral service, a hearse will be used to transport the casket to the cemetery or burial site. A hearse, sometimes called a coach, is a car that is used to transport a casket. Shaped like a station wagon, a hearse has two seats up front (for a driver and one passenger) and a large, covered trunk in the back for the casket. A limousine or sedan can usually hold around 4-7 people. Usually, closest family members are transported in the limousine or sedan. You may also hire a “lead car,” which is driven by a member of the funeral home’s staff to lead the procession of cars to the cemetery. Motorcycle escorts and police escorts are available for the funeral procession. These escorts can be arranged by your funeral director. If you want to transport the body to the cemetery or burial site yourself, you’ll need to figure out your state’s laws on body transportation, as well as obtain any necessary documentation you will need. Be aware that in a few states a transporter’s license is necessary to transport a body, which means that only a licensed funeral home or crematory will be able to handle the transportation. Transportation costs charged by funeral homes can vary significantly. Make sure you get an itemised cost from funeral homes before you sign a contract. Funeral homes usually have their own limousines and hearses available for rent, though you can contract a third-party rental company for these services. If you will be renting transportation from the funeral home, be aware that in addition to the flat rate for the hearse and limousine or sedan, there is often a charge for extra kilometres outside the funeral home’s defined “local” area. Use eziFunerals price comparison service and save time, money and unnecessary grief.